WIND is the first album in the Final Fantasy V: The Fabled Warriors album series, featuring nine tracks from eight artists. It was released on September 10th of 2010 as OC ReMix's 18th community arrangement album. 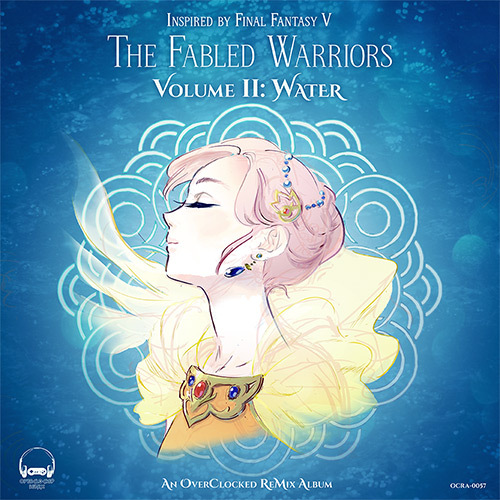 WATER is the second album in the Final Fantasy V: The Fabled Warriors album series, featuring nine tracks from eight artists. It was released on April 25th of 2016 as OC ReMix's 57th community arrangement album. "Well, here it is, at long last. Kind of unbelievable that this is finally coming out. So why’d this thing take so long? What happened? Well, a lot happened, actually. I bought a house and moved out of my parents’ place. I started taking on more stuff at work. OCR got involved with the fighting game community and I started directing albums for tournaments. I started running my own remixing tournaments on OCR for series like Mega Man, and, speaking of Mega Man, I even worked with Capcom to direct OCR’s first commercial album. But with all this stuff going on, I also hit roadblocks creatively as a musician. I was still putting out tracks for the FGC albums, but I wanted my Mystic Knight track on this album to be something really great and bigger than what I’d done before. So I put things off until I could find time, and when I found time I couldn’t make it work creatively, and then I’d get busy again. Finally, it just got to be too much, and I said “I need to be able to tell people at MAGFest that it’s done.” So I sat down and, for a few nights in the week leading up to MAGFest, I pushed through all the creative roadblocks and finally got the track out. But of course, this album series is way more than my dumb track that took way too long to write. It’s filled with awesome music from a really talented bunch of guys. I’m grateful that they’ve been so patient with me, and I’m happy that you’re all going to finally hear their awesome arrangements. Now that WATER is finally out, we’re going to move on to putting together Volume III: FIRE. I’ve got big plans, and while it would be irresponsible of me to promise a release date, I will say that after everything I’ve learned about running all these albums over the years, things are going to move along at a better pace. Keep an eye out, and in the meantime, enjoy The Fabled Warriors: Volume II: WATER." "The album art for WATER represents a total rebranding of The Fabled Warriors as an album series. It’s been over five years since WIND was released, and in that time I’ve met and become great friends with Maya (rnn), who at this point holds the record for most album art for OC ReMix albums and has actually joined the staff as our art coordinator. WIND’s cover art wasn’t bad, but there were a lot of things going on that, looking back, made the whole thing too busy. The giant crystal, the character portraits, the too-official-looking Final Fantasy logo. I wanted to switch gears and go for something more striking. Maya and I talked about doing a single character portrait on each volume, featuring the playable characters of the game. I wanted the character art to have a sketchier, rougher quality, because I had seen a lot of Maya’s in-progress work and found the un-inked sketch work really appealing as an aesthetic. We also settled on the idea of placing each character portrait on an original circular mandala setting inspired by the element. Maya also designed these by hand, and once all of the drawing was done, we were able to use some textures to give the backgrounds more life. The album art for WIND is going to be updated in the future to match what we did for WATER, and FIRE, EARTH, and DAWN are going to follow a similar formula. I’m very excited at how good these albums are going to look. In the meantime, please enjoy the beautiful cover art for WATER." "Having heard Shariq's tracks, a few words came to mind -- gentle, dreamlike, and a little exotic. While doing some research on the character, I saw Yoshitaka Amano's original drawings of Lenna and thought they embodied these qualities, as well as her element, with their flowing, elegant forms. I knew I had to incorporate his version into my own Lenna while still referencing her in-game appearance. On another note, it is curious to me that, despite her association with water, Lenna's color palette consists mostly of warm, sunny hues. I hope the end result gives off a feeling akin to the warm sun reflected on the water's shining surface. Thank you, friends at OverClocked ReMix, for inviting me to collaborate with you again on another fine album!" FIRE is the third album in the Final Fantasy V: The Fabled Warriors album series, and has not yet been completed. EARTH is the fourth album in the Final Fantasy V: The Fabled Warriors album series, and has not yet been completed. DAWN is the fifth and final album in the Final Fantasy V: The Fabled Warriors album series, and has not yet been completed. 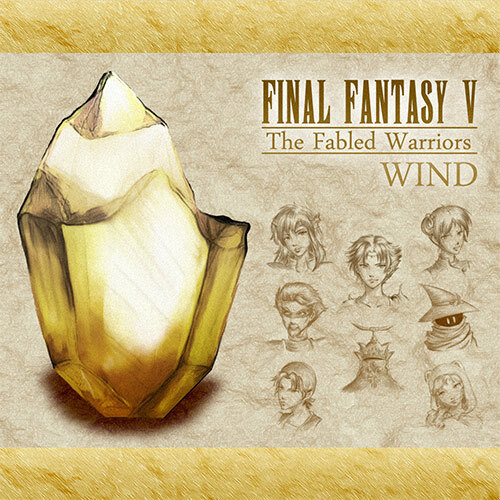 The Fabled Warriors is a series of five free albums from OverClocked ReMix that celebrates Nobuo Uematsu's classic score for Square's Final Fantasy V. Each album is comprised of themes for important characters in the series as well as the myriad of job classes that made the game famous. I have always felt that Final Fantasy V's soundtrack has a bit of lightness to it that other Final Fantasy soundtracks eschew in favor of darker, moodier themes. This game always struck me as more of an adventure than any of the others in the series, and Uematsu's score grabs that and runs with it. This is nowhere more evident than in 'Ahead on Our Way,' Final Fantasy V's main theme, and in my opinion, the best main theme for any Final Fantasy game. I hope everyone enjoys this tribute to Nobuo Uematsu's wonderful score. We hope to make each album better than the last!